Our solar system is composed of the Sun and all things which orbit around it: the Earth, the other eight planets, asteroids, and comets. 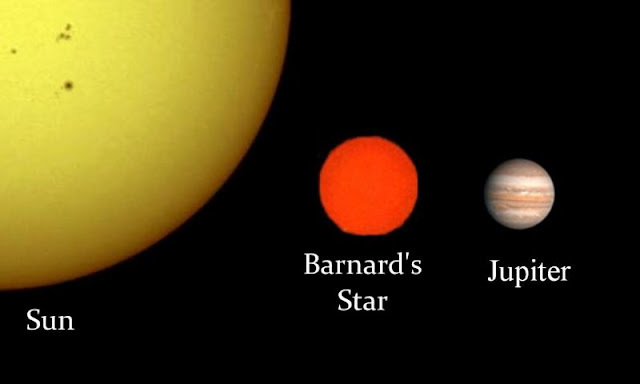 However, since it is by far the closest star to the Earth, it looks bigger and brighter in our sky than any other star. With a diameter of about 1.4 million kilometer s (860,000 miles), it would take 110 Earths strung together to be as long as the diameter of the Sun.The Sun is mostly made up of hydrogen (about 92.1% of the number of atoms, 75% of the mass). Helium can also be found in the Sun (7.8% of the number of atoms and 25% of the mass). The other 0.1% is made up of heavier elements, mainly carbon, nitrogen, oxygen, neon, magnesium, silicon, and iron. The Sun is neither a solid nor a gas but is actually plasma. This plasma is tenuous and gaseous near the surface but gets denser down towards the Sun’s fusion core. Stars like the Sunshine for nine to ten billion years. The Sun is about 4.5 billion years old, judging by the age of moon rocks. Based on this information, current astrophysical theory predicts that the Sun will become a red giant in about five billion (5,000,000,000) years. The sun contains more than 99.8% of the total mass of the Solar System (Jupiter contains most of the rest). The sun is an average star, its size, age, and temperature fall in about the middle of the ranges of these properties for all stars. Some in our galaxy are nearly as old as the universe, about 15 billion years, our sun is a 2nd-generation star, only 4.6 billion years old. Some of the sun’s material came from former stars. We’ve always known the sun, unlike many other objects in our solar system, the sun has been known to humans since the dawn of time. There is no discovery date or discoverer. The solar “surface,” known as the photosphere, is just the visible 500-km-thick layer from which most of the Sun’s radiation and light finally escape, and it is the place where sunspots are found. 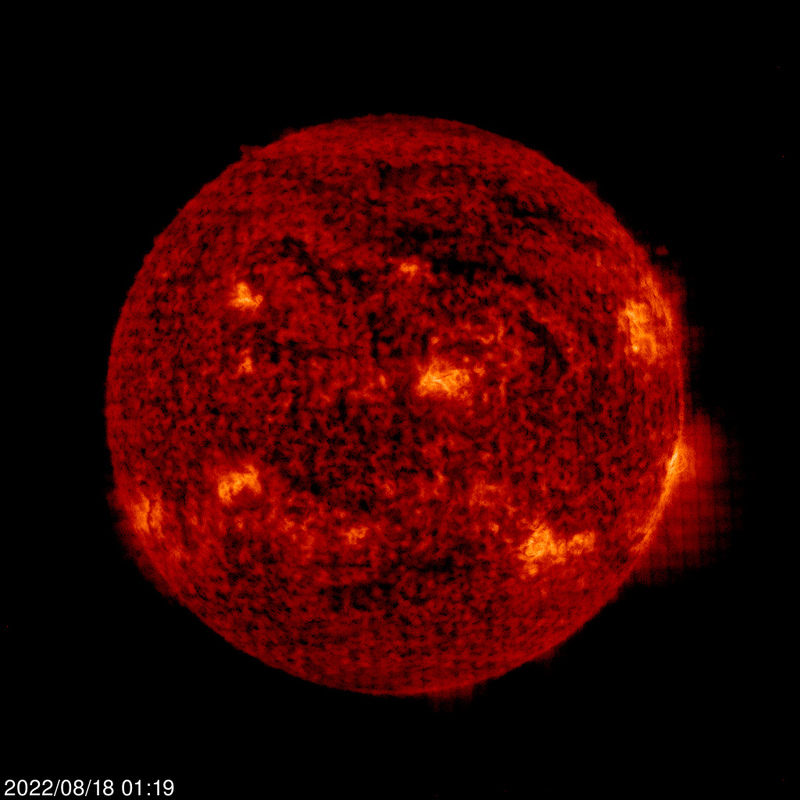 Above the sun’s photosphere lies the chromosphere (“sphere of color”) that may be seen briefly during total solar eclipses as a reddish rim, caused by hot hydrogen atoms, around the Sun. The corona (“crown”) is above the chromosphere, extending outward from the Sun in the form of the “solar wind” to the edge of the solar system. One unsolved mystery of the sun involves the corona (“crown”), why is extremely hot – millions of degrees kelvin. 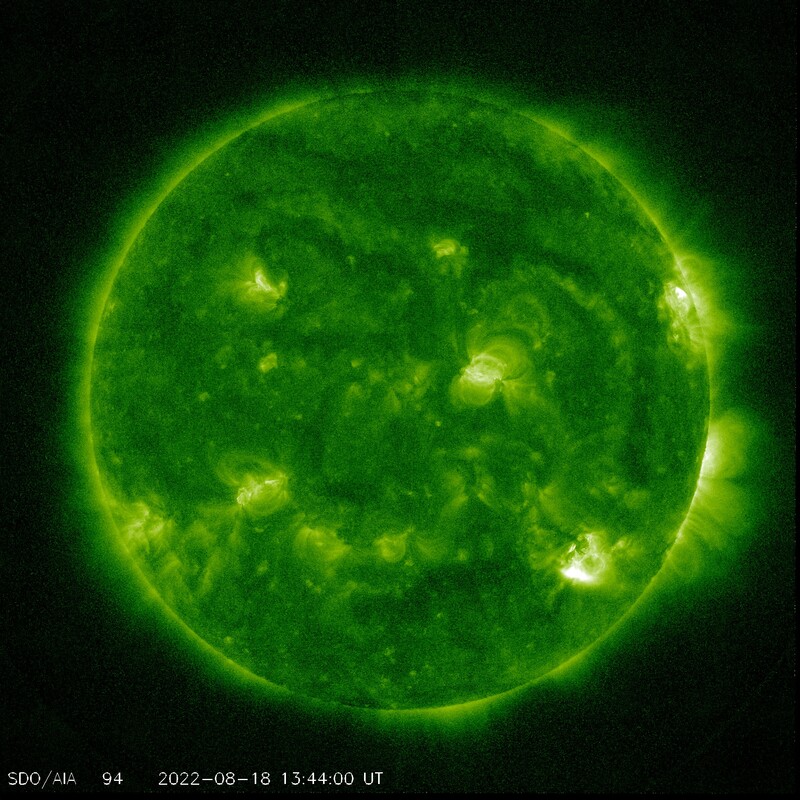 It is physically impossible to transfer thermal energy from the cooler surface of the Sun to the much hotter corona, the source of coronal heating has been a scientific mystery for more than 60 years. The Greeks named the sun Helios, the Romans used the name Sol, which is still in use today. Ulysses was the first spacecraft to study our Sun’s poles. The sun’s strong gravitational pull holds Earth and the other planets in place. 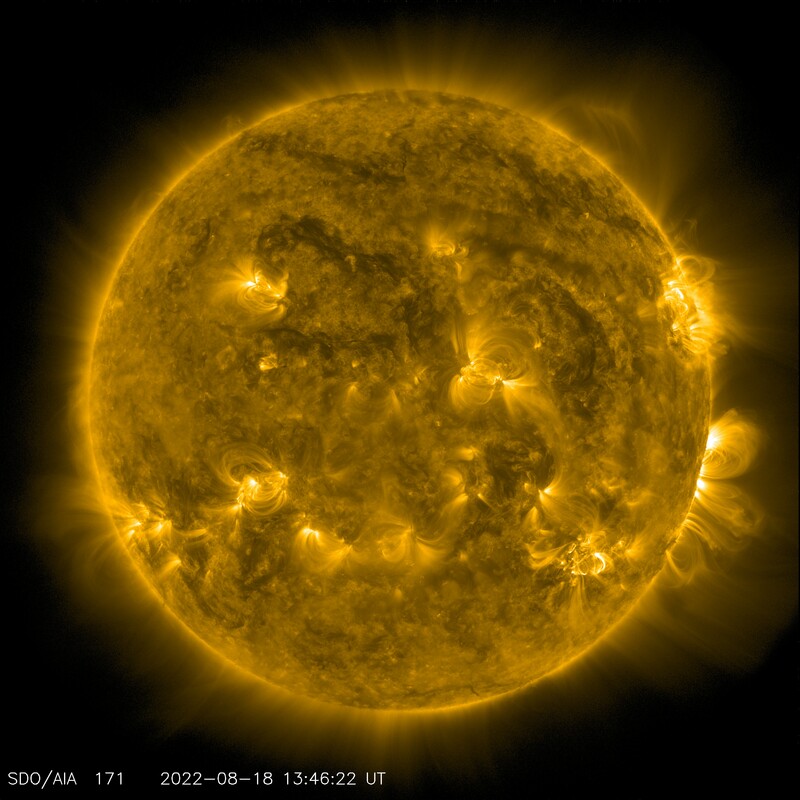 The sun is made up of distinctive areas In addition to the energy-producing solar core, the interior has two distinct regions: a radiative zone and a convective zone. 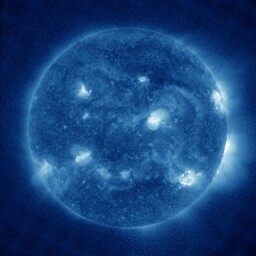 This is the inner most part of the Sun. Here gravity has squeezed the Sun so much that hydrogen compresses together to form helium and release energy through nuclear fusion. All the energy that comes away from the Sun and all the reaches the Earth started in the core. The core is around 150 times as dense as water and has a blazing temperature of around 15 million degrees Celsius or 28 million degrees Fahrenheit. 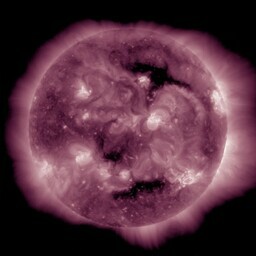 This is the layer of the Sun above the super dense core. The density slowly decreases moving away from the core. Light produced by nuclear fusion in the core travels out in the shell called the radiative zone. This layer is not as dense as the core but it is still so dense that light from the core bounces around taking about 100,000 years to move through the radiative zone. 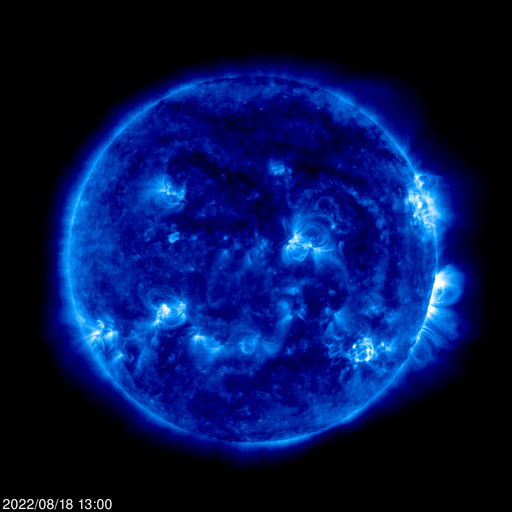 This is the layer of the Sun above the radiative zone. When the density of the radiative zone becomes low enough energy from the core in the form of light is converted into heat. Much like the bubbles in a pot of boiling, the heat from the edge of the radiative zone rises until it cools enough that it sinks back down. This pattern of heated material rising then cooling happens in big bubbles called convection cells. The material that reaches the top of the convection zone cools by giving of light. This region of the Sun is the first part of the Sun that is visible to us and we call it the photosphere. This is where the light we see from the Sun originates. If we could look at the Sun directly (never stare at the Sun without the proper equipment) we would see the photosphere. Even though the layer is not solid we call this part of the Sun the surface and it is also where the solar atmosphere starts. Its temperature is around 5,800 Celsius or 10,000 degrees Fahrenheit. 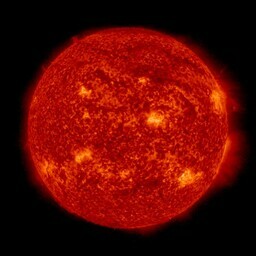 Above the photosphere is a layer of the atmosphere about 2,000 km thick called the chromosphere. The temperature increases as you move higher to about 20,000 degrees Celsius at the top of the chromosphere. 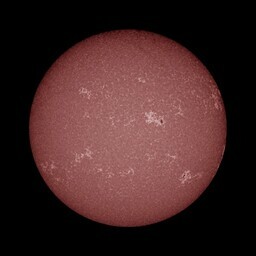 The chromosphere is no longer white light like the photosphere but is mostly red in the visible light. It can be seen as red flashes during a total solar eclipse. 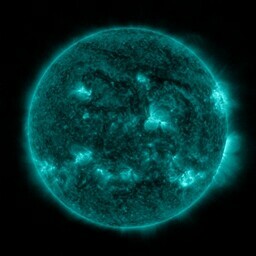 The highest part of the solar atmosphere is called the corona. The corona starts around 10,000 km above the solar photosphere. Unlike the atmosphere of the Earth the atmosphere of the Sun continues to get hotter as you move away from the solar surface. The answer to why exactly this happens is one of the biggest questions of astronomy and solar physics of the 20th and 21st centuries. At 20,000-25,000 km away from the solar surface, the corona has an average temperature of 1,000,000 to 2,000,000 million degrees Celsius. But the density is very low, about 1 billion times less dense than water. 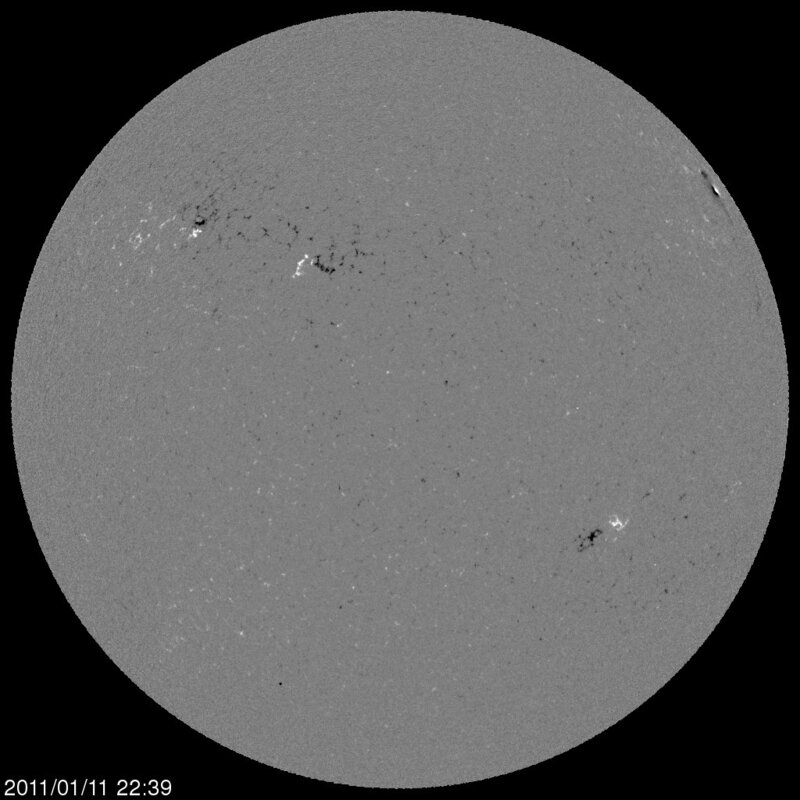 Sunspots appear as dark patches in the solar photosphere. These are areas where strong magnetic field has emerged from below the solar surface. The strong magnetic field suppresses the release of heat into the photosphere making sunspots cooler than their surroundings. 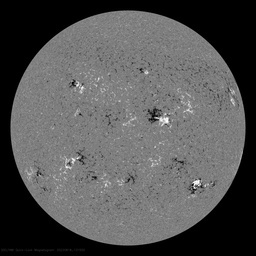 Because they are much cooler than the surrounding photosphere sunspots appear darker even though they are still many 1000s of degrees Celsius. 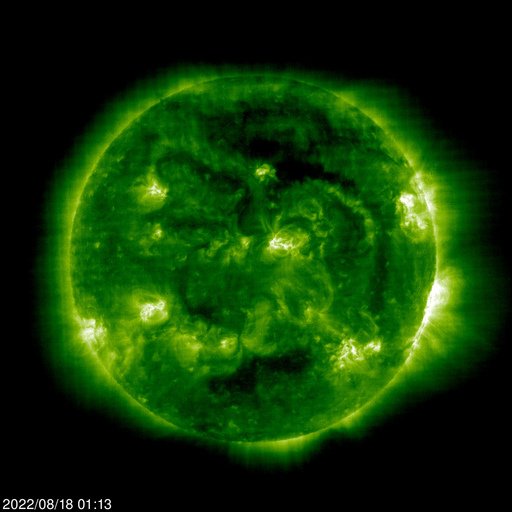 An active region on the sun — an area of intense and complex magnetic fields — has rotated into view on the sun and seems to be growing rather quickly in this video captured by NASA’s Solar Dynamics Observatory between July 5-11, 2017. Such sunspots are a common occurrence on the sun, but are less frequent as we head toward solar minimum, which is the period of low solar activity during its regular approximately 11-year cycle. This sunspot is the first to appear after the sun was spotless for two days, and it is the only sunspot group at this moment. Like freckles on the face of the sun, they appear to be small features, but size is relative: The dark core of this sunspot is actually larger than Earth. NASA Scientist C. Alex Young discusses recent sunspot activity during Live Shot. Sometimes magnetic field in the solar atmosphere holds up solar plasma from the chromosphere into the solar corona. The filaments are held up in a kind-of magnetic hammock. The relatively cool filament material appears dark when observed against the bright solar disk. Filaments can stretch far across the Sun measuring 100s of thousands of kilometers. The equivalent of 10 or more Earths lined up in a row. 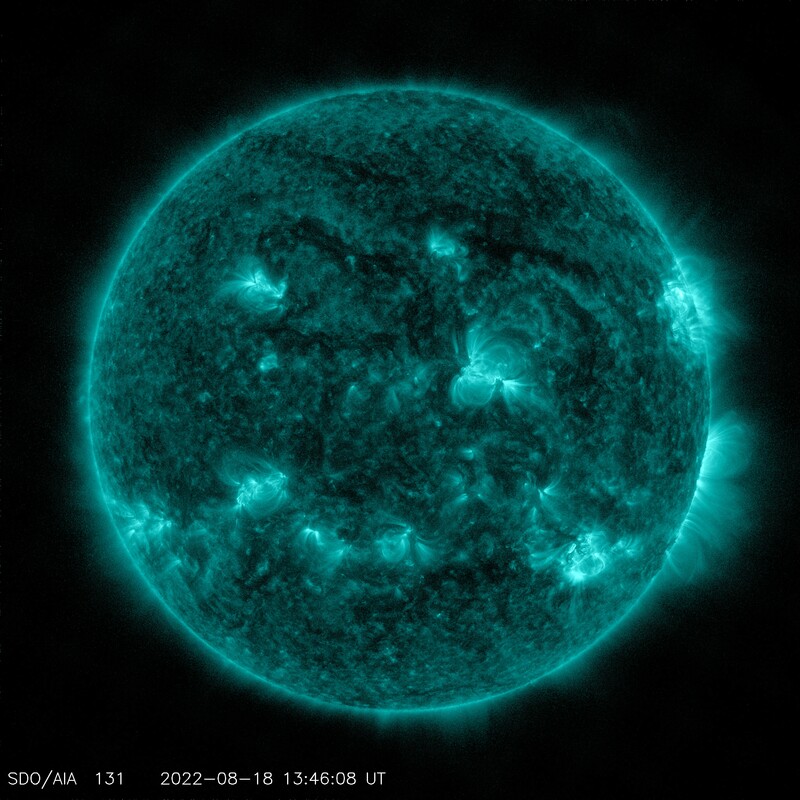 On August 31, 2012 a long filament of solar material that had been hovering in the sun’s atmosphere, the corona, erupted out into space at 4:36 p.m. EDT. 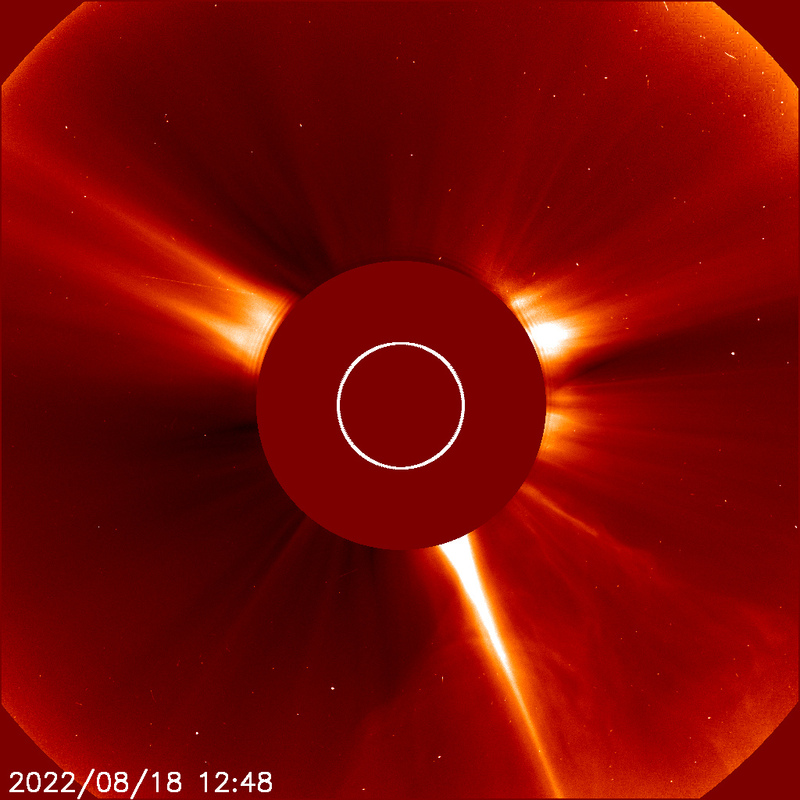 The coronal mass ejection, or CME, traveled away from the sun at over 900 miles per second. This movie shows the ejection from a variety of viewpoints as captured by NASA’s Solar Dynamics Observatory (SDO), NASA’s Solar Terrestrial Relations Observatory (STEREO), and the joint ESA/NASA Solar Heliospheric Observatory (SOHO). Prominences are really just the same thing as filaments only viewed from a different perspective. 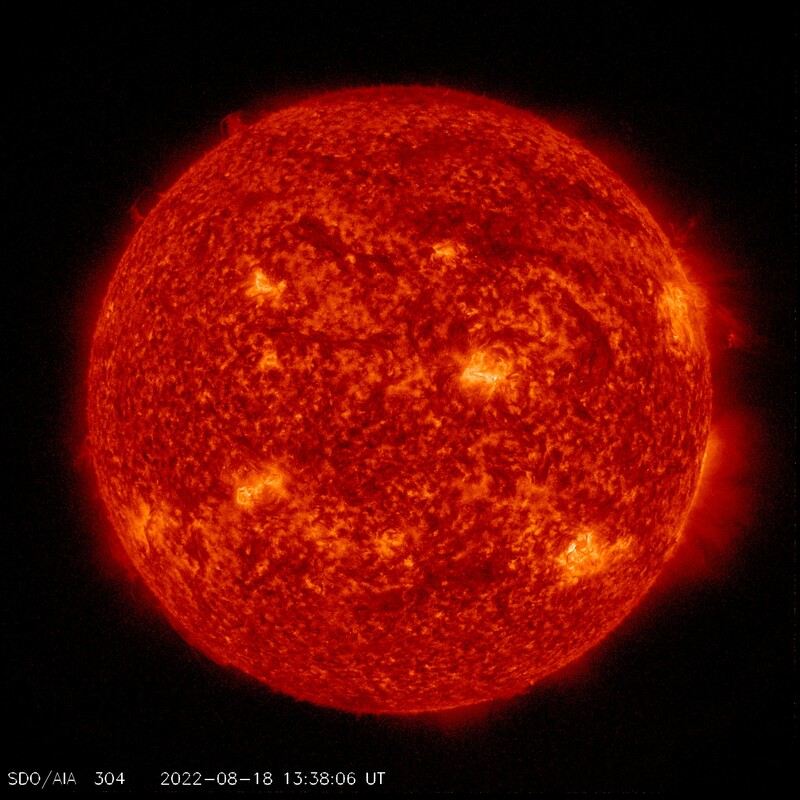 Filament are seen on the solar disk however filament are very high up in the solar atmosphere, way above the surface. So when a filament is on the edge of the Sun the filament sticks out with space instead of the solar surface behind it. 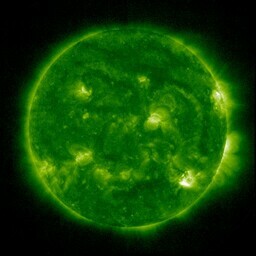 This makes the filament very bright compared to the dark (cold) background of space. We call a filament viewed this way a prominence. They can be simple looped shaped object or very irregular with a complicated structure. Over a six-hour period on April 21, 2015, NASA’s Solar Dyanmics Observatory (SDO) observed a wing-like prominence eruption. SDO views the sun in various wavelengths of the extreme ultraviolet, including 171 (shown in gold) and 304 (shown in orange) angstroms. Coronal Holes are areas on the Sun that appear dark when observed in Extreme Ultraviolet and x-ray light. They are regions where the magnetic field on the solar surface opens up into space making it easier for coronal material to escape. Because these areas have less corona, they have less material to emit light and so appear dark compared to the rest of the corona. Coronal holes are believed to be the origin of the high-speed solar wind. They occur mostly near the north and south poles but they can occur at other places on the solar disk. 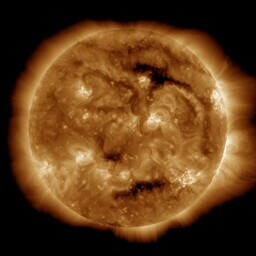 NASA questions whether an area of the sun’s open magnetic field will effect Earth’s electronic communications. The solar magnetic field changes on an 11 year cycle. 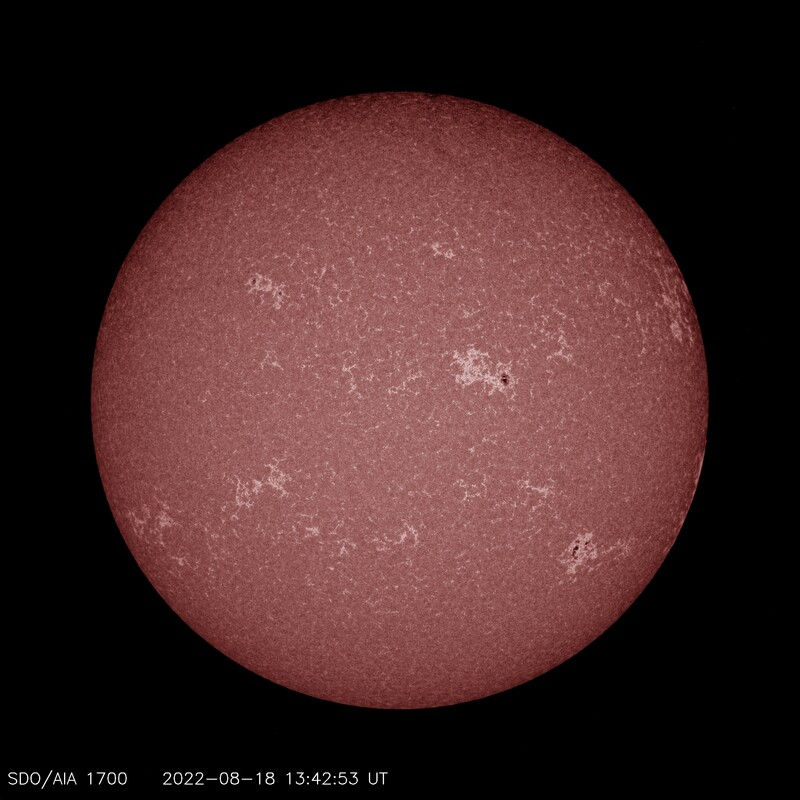 Every solar cycle, the number of sunspots, flares, and solar storms increases to a peak, which is known as the solar maximum. Then, after a few years of high activity, the Sun will ramp down to a few years of low activity, known as the solar minimum. 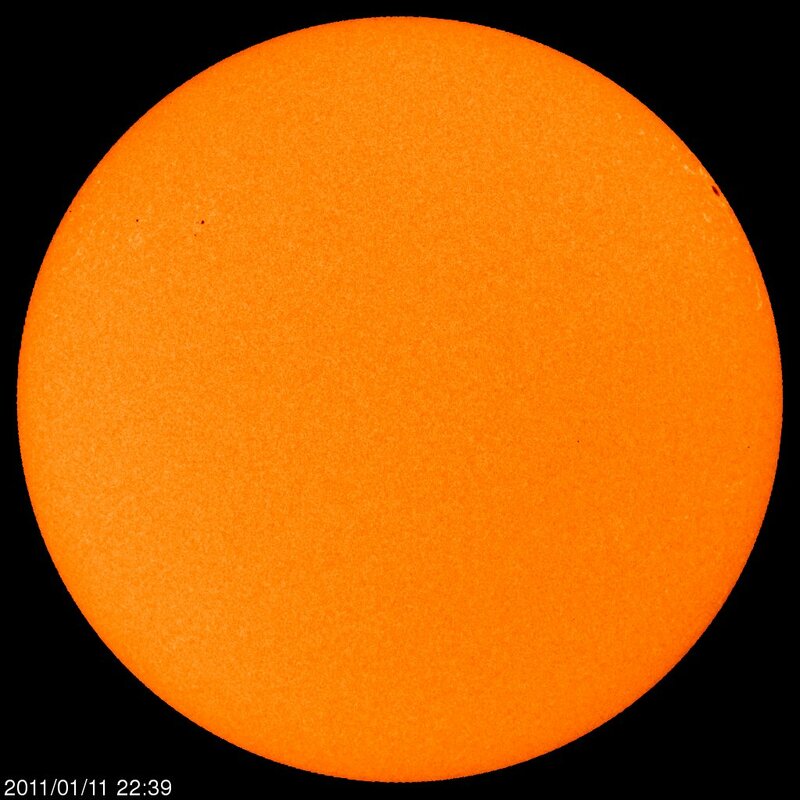 This pattern is called the “sunspot cycle”, the “solar cycle”, or the “activity cycle”. 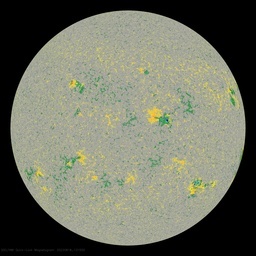 The entire sun’s magnetic polarity flips approximately every 11 years — though sometimes it takes quite a bit longer — and defines what’s known as the solar cycle. 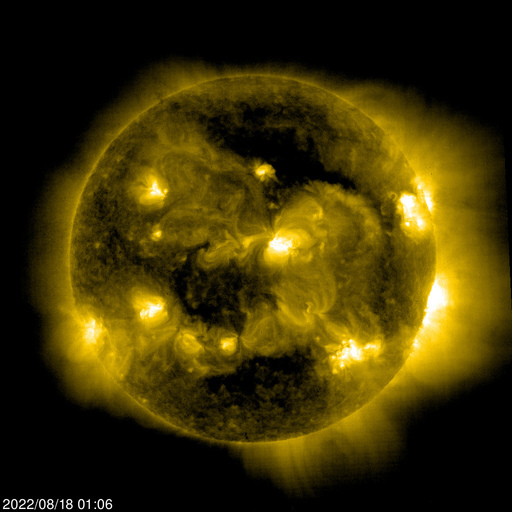 The visualization shows how in 1997, the sun shows the positive polarity on the top, and the negative polarity on the bottom. Over the next 12 years, each set of lines is seen to creep toward the opposite pole eventually showing a complete flip. 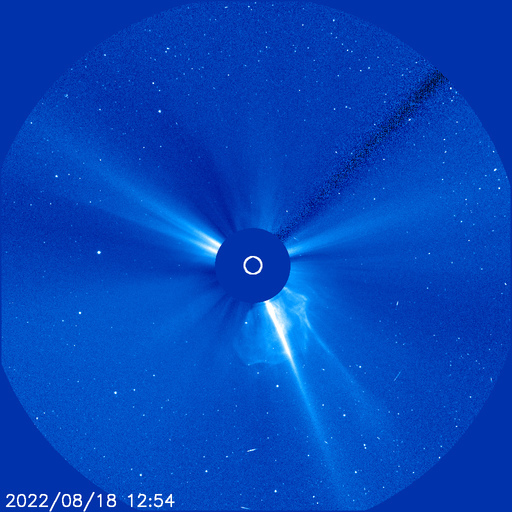 By the end of the movie, each set of lines are working their way back to show a positive polarity on the top to complete the full 22 year magnetic solar cycle. Updated multiple times daily. Click for larger images.